No one can accuse Kelley Armstrong of taking the easy road. Imagine a book where the heroine is dead. She’s been dead, in fact, for three years. Her love interest is dead too. He died at 47 with a paunchy belly and thinning hair. Oh, and they both have a reputation for being evil. That’s the short version of Eve Levine and Kristof Nash. But there is so much more to the story than what you see at first glance. Both Eve and Kristof exist in one of many ghostly planes. Kris is eager to renew the love affair they had 15 years ago. But Eve is reluctant –and distracted. She can’t let go of their daughter Savannah, who is still in the living world. Kris thinks she needs something more to focus on in her afterlife, so he’s happy when the Fates ask Eve’s help in tracking down a ghost-demon who is possessing bodies in the living world, and committing murder. The storyline opens the door to a new supernatural branch: angels. We meet a couple and quickly learn Eve might be a candidate for ascension, herself. The action is pretty good here. And I was a little surprised. I mean, how much tension can there be if the heroine is already dead? It’s not like the bad guy is going to kill her or anything. Yet Armstrong makes it work. There are worse things than dying and Eve takes real risks to complete her mission. I was also surprised to find I wasn’t really put out by the fact that Kristof was no Joe Mangianello. (If you don’t know who that is, Google him immediately.) It was plain that he and Eve have been doing the sexual-tension dance for a while… which makes their relationship intriguing. My one beef is that when we finally get to the payoff, Armstrong fades to black. I felt kind of cheated. It ended up a much better book than I expected… though not the strongest in the Otherworld series. I enjoyed catching up with Paige, Lucas & Savannah… and getting to know Eve and Kristof. Plus, the ending keeps the door open for their characters to show up again. 4 stars. Oh this sounds GOOD. I’ve read some of her YA stuff but that’s it so far. I will have to check out this book! I’ve never read her YA books, but I’ve read all 11 books in the Otherworld series. They are really good. I suggest starting with Bitten. You don’t have to. The books make sense as stand-alones, but they are richer when read in order. Ok thanks! I have so many books to get to (don’t we all?) 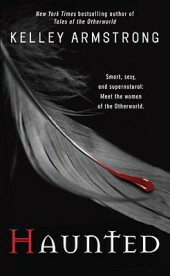 but I will definitely add Bitten to my goodreads TBR to remember to look for it! I need to read this series. I have them on my tbr list 🙂 It looks good!